The VL800 BeamLine is a linear moving head unit offering a wide variety of unique effects and animation options. Its 12 RGBW LED emitters produce a bright (>3000 lumen) and distinctive, flat sheet of light with a collimated 3.5° beam angle. 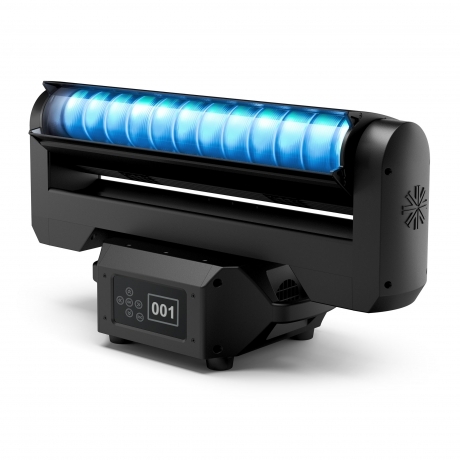 The unit offers advanced dynamic capabilities with fast, continuous pan and tilt, plus Vari-Lite’s exclusive Mega-step and Twist functions on both pan and tilt channels. The VL800 BeamLine’s unique looking optical system and comprehensive RGBW color mixing capabilities are complemented by the possibility for pixel-mapping in 12-zone mode, allowing for the extra dimension of video integration. The VL800 BeamLine is compact and lightweight, designed to maximize performance, reliability and ease of maintenance.